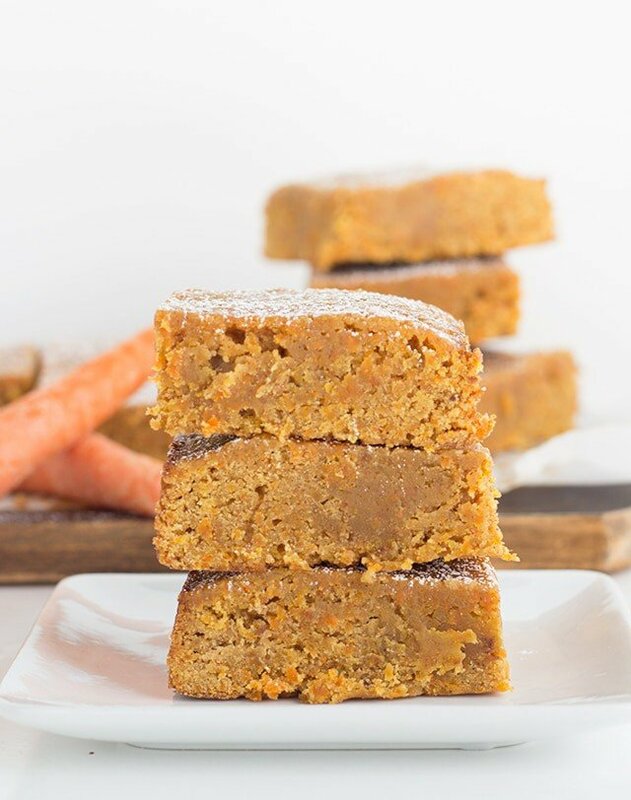 Who loves carrot cake? I do. It’s so darn good. 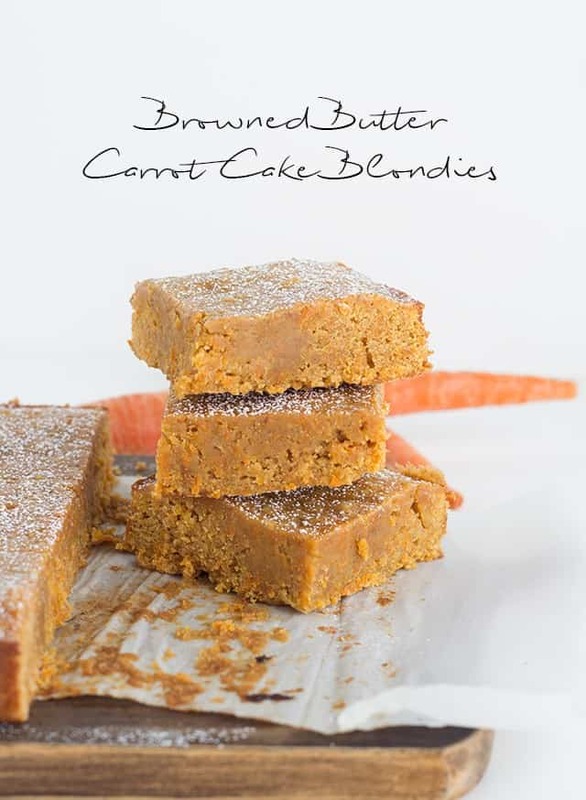 Let’s get a little crazy and make some browned butter carrot cake blondies then. If you’re on the look out for some fantastic carrot cake instead, you must check out this caramel frosted carrot cake. I was going for some super dense blondies. I think it was a job well done. 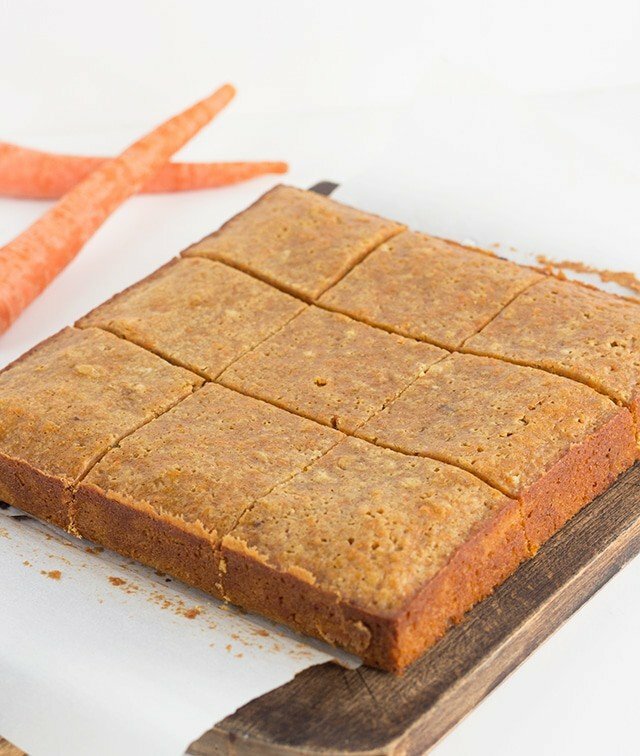 It has some spice, loads of sweetness, and even more bits of grated carrot. I also think these blondies would be outstanding warmed up and topped with some vanilla caramel ice cream. If anyone tries it, do tell me about it. I added some butterscotch chips to these blondies. I think it really helps to make them dense. If you’re not much of a butterscotch fan, you could definitely substitute with white chocolate chips. I haven’t tried it with the white chips, but I’m pretty confident the blondies will be just as good. Preheat oven to 350 degrees. Spray an 8x8 square pan with non-stick cooking spray. Line the pan with parchment paper. Spray the parchment paper with non-stick cooking spray as well. In a medium mixing bowl, add in the butterscotch chips. In a small fry pan, add in the cubed butter. Turn the heat to medium and let the butter melt. Occasionally swirl the butter in the pan. Pay attention to the solids that will start to stick at the bottom. It will take about 10 - 12 minutes to get to this stage. Watch it carefully though. Once the butter starts to brown up slightly, remove from heat and immediately add in with the butterscotch chips. Let it sit for a couple of minutes to help melt the chips. Whisk the butter and butterscotch chips together. Mine didn't melt completely, so I placed the bowl in the microwave and heated it for 30 seconds. I whisked again and repeated heating it in the microwave for 30 seconds. Whisking afterwards. If there are still a few small bits, I wouldn't worry about it. They will melt once the brown sugar is added. Add in the brown sugar. Using a hand mixer, beat until incorporated. Add in the egg and vanilla and beat on medium for about 1 minute. The mixture will lighten up. Add in the grated carrots, flour, ground cinnamon and nutmeg. Beat on low until the flour is just incorporated. Don't over-beat the batter. Pour the batter into the baking pan. Spread out evenly. Place in the oven and bake for 30 minutes or until done. Place a toothpick in the center of the brownies and if moist crumbs come out, the brownies are done. If wet batter comes out, let it bake a bit longer. Who loves butterscotch other than me? Do tell in the comments! 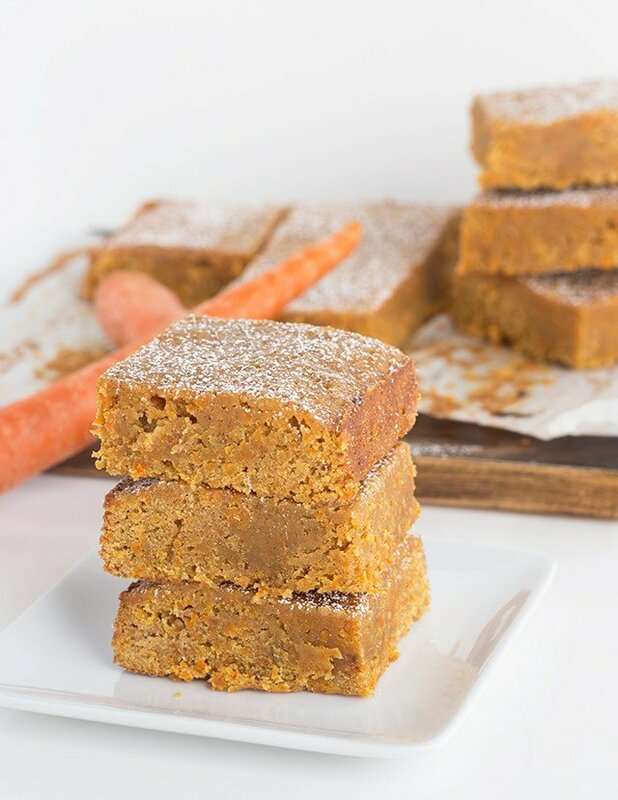 I love carrot cake and these blondies are such a great idea. The butterscotch puts them over the top. Pinned! These look delicious and easy. Yummy! Thank you! They are incredibly delicious and easy. Hello beautiful blondies! Love that carrot cake twist! 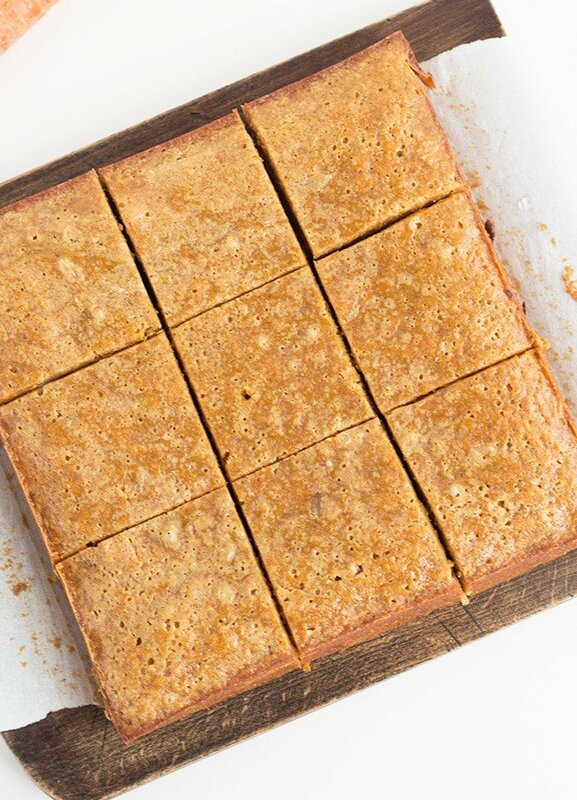 I love dense, chewy blondies and these seem like they are exactly that! Indeed they are! 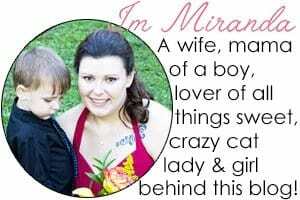 You would be in heaven, Marye! These look so moist and perfect for Easter! My kiddo is a Carrot Cake nut! I am going to have to try these for him! I bet he would love these, they look awesome! Thanks Brandy! Let me know if you make them for the son! These look so rich, dense and moist — everything a blondie should be! I can’t wait to try them. These look so chewy, just the way I love my blondies. Love your twist on them! Thanks Cindy! They were delish! Oh my do these sound good! And I love the suggestion warmed up with ice cream! This sounds very interesting but very good. haha! It is true, brown butter is the way to go! These look amazing! And then the butterscotch chips!?! I’m in love! I bet this would be so good with ice cream or with coconut frosting! Yum! Thank you! Oh, coconut frosting. That’s a brilliant idea! Oh my, YES! Warmed and topped with vanilla ice cream is an excellent suggestion that I can’t wait to try! Thanks for sharing at the Inspire Me Mondays Link-Up!